Senator Grace Poe is the daughter of National Artist Fernando Poe Jr. and veteran actress Susan Roces. She finished high school at Assumption-Makati, where she excelled in oratorical competitions and was named Captain of the Assumption Debating Team. She studied at the University of the Philippines (UP) and Boston College in Massachusetts, where she earned her Bachelor of Arts degree major in Political Science. She made Philippine election history by garnering the highest number of votes of more than 20 million in the May 2013 elections. This overwhelming mandate inspires her to work hard towards her father’s dream of uplifting the lives of the Filipino people. As the chairperson of the Committee on Public Information and Mass Media, she championed the passage of the Freedom of Information (FOI) Act, which was approved on third reading by the Senate on March 10. She believes that the attainment of a just, progressive and lasting peace in the country greatly depends upon the free flow of information to the public. 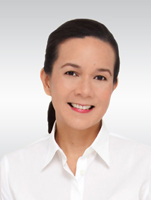 Sen. Poe is also the first lady senator to serve as chair of the committee on public order and dangerous drugs. Over the years, she has spent her career standing for the rights of Filipino people. Making sure everyone especially children has access to quality education and proper nutrition is her major legislative priority that’s why one of the first bills she filed in the Senate was the Free Lunch Program which seeks to provide free lunch to malnourished children in all public schools nationwide. And true to her “showbiz” roots, Poe has also filed a bill promoting Film Tourism that aims to make the Philippines into a major shooting destination for international films. As chair of the Movie and Television Regulatory and Classification Board (MTRCB), she advocated “intelligent media viewership” instead of “censorship” and formulated a new, age-appropriate ratings system designed to empower parents to exercise caution and vigilance with the viewing habits of their children.